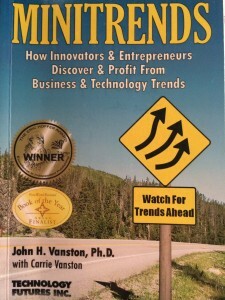 If you are some one who is in search of innovative ideas, be it for individuals, small-, medium-, large- size companies, and want to become a master at developing and/or prospering from such trends, the book “Minitrends” by John H. Vanston with Carrie Vanston may be purchased via amazon.com. If you are looking for events to interact with other innovators and thought-leaders interested in future of technologies, please feel free to go to: www.minitrends.com/contact to find out when and where the 3rd Annual MiniTrends Conference will be held. This entry was posted on Thursday, December 26th, 2013 at 4:21 PM	and is filed under Business & Opprotunity, Educational. You can follow any responses to this entry through the RSS 2.0 feed. You can leave a response, or trackback from your own site.